More than half of Coloradans who don’t have health insurance qualify for public health insurance programs or advance premium tax credits. Key reasons why people may not enroll include not knowing how to enroll, not understanding the need for health insurance or fear that a family member without legal documentation may be discovered. One of four Coloradans without health insurance are immigrants without documentation—disqualified from receiving any coverage assistance. About 115,000 Coloradans were uninsured in 2016 even though they were eligible for the Medicaid or Child Health Plan Plus (CHP+) public programs, down slightly from 130,000 a year earlier, according to a new analysis by the Colorado Health Institute (CHI). The annual eligible but not enrolled (EBNE) number is a closely watched statistic that gauges the effectiveness of outreach and enrollment efforts designed to help Coloradans without health insurance get coverage. Colorado’s Medicaid and CHP+ enrollment has reached historic levels, a result of the state’s 2013 decision to expand eligibility under the Affordable Care Act (ACA) as well as extensive statewide outreach efforts since then. But even with those 1.3 million enrollees in Medicaid and CHP+, 115,000 eligible Coloradans instead remain uninsured. The study found little change in the number of Coloradans who failed to take advantage of tax credits they could have received to help purchase insurance through the state-based marketplace — 121,000 of those eligible for the tax credits remained uninsured in 2016 compared with 122,000 in 2015. The data suggest that the provisions in the ACA designed to help low-income and middle-income earners gain insurance — Medicaid expansion and the tax credits —have already had their greatest impact since the 2014 launch of the ACA. This research brief updates CHI’s annual Medicaid, CHP+ and Advance Premium Tax Credit (APTC) enrollment analysis, evaluating the reach of these programs and examining the populations that remain uninsured despite their eligibility. Not know about the programs or how to get enrolled. Prioritize other needs such as housing or food because of limited financial resources. Lack the mental or physical capacity to navigate the system and get enrolled. Fear that a family member who lacks legal documentation may be discovered. Not understand the need for insurance. Have political or ideological opposition to enrolling in a government program. Outreach and enrollment programs work to address those factors. Meanwhile, 101,000 of the 410,000 uninsured were not citizens or legal permanent residents, according to a CHI statistical model. Immigrants without documentation are not eligible to enroll in Medicaid or CHP+, except in extraordinary circumstances, or to buy insurance through the marketplace at all. This means that immigrants without documentation accounted for one of four uninsured Coloradans in 2016—a similar rate to 2015, but up from one of five in 2014. (See Figure 1 Above). About 47,000 of the uninsured Coloradans weren’t eligible for any sort of coverage assistance because they had annual incomes of more than four times the federal poverty level (FPL), or about $48,560 for an individual in 2018. This put them above the eligibility cut-offs for both public insurance and tax credits. Finally, the remaining 26,000 weren’t eligible for coverage assistance because an employer had offered them the opportunity to purchase affordable coverage. The ACA defines employer-sponsored insurance as “affordable” if it does not cost the employee more than 9.7 percent of his or her income. While these are small changes from 2015, they do represent large gains in coverage from 2014, when 534,000 Coloradans went without insurance. 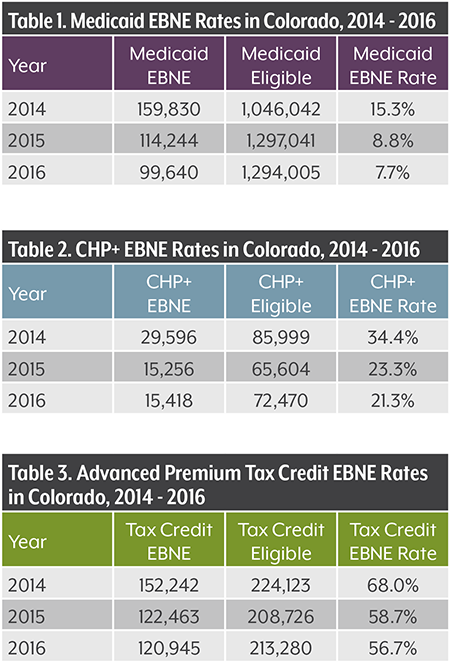 EBNE rates are generally highest among Coloradans who qualify for tax credits but earn too much to enroll in Medicaid or CHP+ (between 139 percent and 400 percent of the FPL for most adults and between 266 percent and 400 percent of the FPL for children). This is likely due to cost—public health insurance offers free or low-cost coverage, but many Coloradans have found private health insurance on the state marketplace to be unaffordable, even after subsidization. Parts of Colorado that rely more heavily on the individual market for coverage often have higher EBNE rates than areas with more public insurance (Explore the Interactive Map Below). EBNE analyses help policymakers and outreach and enrollment specialists evaluate levels of health insurance assistance their areas. With recent policy changes, including reductions in outreach and enrollment funding and the elimination of federal subsidies for co-payments for some low-income Americans, tracking the use of these programs is more important than ever. Additional data on EBNE rates are on CHI’s website. Data tables are available for the overall uninsured population. They are also broken down by adults and children. EBNE populations are also split by various demographics such as race/ethnicity and age. When we refer to someone as EBNE, we mean that they are uninsured even though they are eligible for Medicaid or Child Health Plan Plus (CHP+) public insurance or for an advanced premium tax credit (APTC) to purchase insurance through Connect for Health Colorado. Eligibility is based on income, age, citizenship status and more. The Colorado Department of Health Care Policy and Financing (HCPF) provided enrollment data for Medicaid and CHP+. Connect for Health Colorado provided enrollment data for APTCs. The U.S. Census Bureau’s 2016 American Community Survey (ACS) provided estimates of uninsured populations. 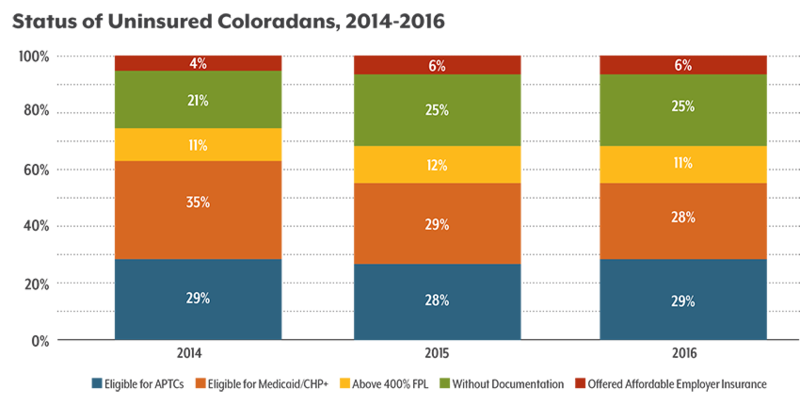 The ACS is an annual stratified random sample survey of approximately 55,000 Coloradans. Emily Johnson joined the Colorado Health Institute in May 2015 as a senior policy and statistical analyst. She is now a Director. At CHI, she conducts financial modeling and other forms of quantitative analysis on health policy proposals. She studies how both local and federal proposals could impact Colorado, its budget and its residents.